The Clemson Tigers are your 2018 NCAA Football Division 1 National Champions! Dabo Swinney and company defeated Nick Saban and the Alabama Crimson Tide by a final score of 44-16 to claim their second championship in three seasons. Alabama had plenty of opportunities to crawl back into the fight, but the Clemson Tigers were in control from the second quarter on. The Tigers and Crimson Tide have met in the postseason for four consecutive seasons. Tonight’s Clemson victory evens the series at two apiece. The game got off to an exhilarating start that gave fans almost no time to breath. The Tigers opened the scoring with a pick six of Tua Tagovailoa, Jerry Judy tied the game with a ridiculous 62-yard touchdown reception, Clemson responded with a deep pass and touchdown of their own, and the Crimson Tide pissed a PAT. All of this transpired within the first nine minutes of the game. Alabama took a 16-14 lead early in the second quarter, but things began to tilt in the favor of the Clemson Tigers before halftime rolled around. Clemson’s defense stopped the Crimson Tide on seven straight plays deep in the red zone to force a field goal, scored another pair of touchdowns, and recorded an additional interception. The Tigers lead 31-16 heading into halftime. The Crimson Tide had a chance to make it a game in the third quarter until Nick Saban attempted a very suspect fake field goal that was followed by a 74-yard touchdown pass from Trevor Lawrence to Justyn Ross. After another stop, the Clemson wide receivers went to work with some incredible catches from Justyn Ross and Tee Higgins on what was ultimately the back-breaking scoring drive. 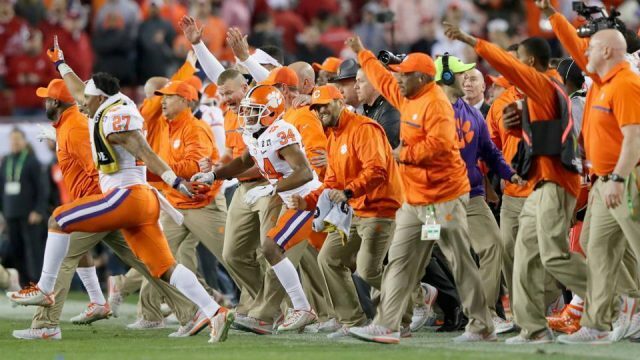 Many anticipated a blowout, but no one could have imagined Clemson would be the one dishing out the blows. Even without Dexter Lawrence, Clemson’s front seven was able to keep the Crimson Tide in check, holding to only 16 points despite their 442 total yards. They forced two turnovers and made three fourth down stands (including the fake field goal).